I'm off on holiday with my family very soon - so wanted to make myself a travel pouch to keep all the passports and tickets in. I found the fabric on special a few weeks ago and couldn't resist! Then when I picked up our travel documents and tickets and saw the wallet they all came in.. I thought - now there's a quick project to use up the fabric! So here's the tutorial - if you want to make one yourself! So first you start with the smallest pockets. Those cut from the outer fabric. Double turn one longer edge on each pocket and stitch - this will be the tops of the pockets. Repeat this for the 4 inner fabric passport pockets. Now you need to stitch the small card pockets to the bottom of 2 of the passport pockets. Then match up the next card pocket with the very bottom of the passport pocket. Pin then stitch. Place them so the bottom pocket will hide the base of the second one. Pin both then stitch along the base of each pocket. Now double turn one longer edge of these pockets - pin then stitch to neaten the edge. Now to the outer part of the wallet. First you need to make the hidden zip pocket. Pin one of your pocket pieces to the right side of the outside fabric. Centrally placed and about 3cm (1.25") in from the edge. 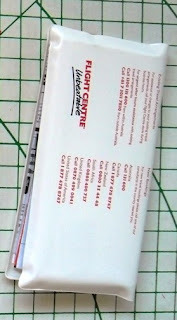 (remember you're pinning this to the side of your wallet - so along the edge that is 26 cm (10.25") long. Now turn your fabric over - and pin the remaining pocket rectangle to the one you just attached. Stitch around all 4 edges to make your pocket! Now place your inner and outer fabric wallet pieces right sides together. Pin and stitch around the sides and the bottom. Leave the top open! Turn right sides out and press. Then place pins up the centre seam of the inside of the wallet. And stitch through both layers along this line. Push the card rectangles into either side of the wallet from the open top end. Then fold the ends in on themselves and pin then stitch closed. Now your basic wallet is almost finished! Turn the tube right sides out, then using a safety pin thread your elastic through the tube you just created - making sure to keep hold of both ends of the elastic! 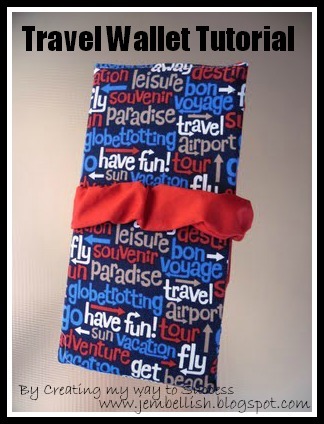 The zip pocket is perfect for some ready cash at the airport! Then slip the elastic around your closed wallet to keep it secure! And you're all set for a big trip!! The wallet fits perfectly into my new duffel handbag! 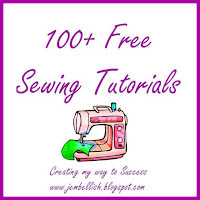 For the downloadable PDF version of this tutorial, click here. 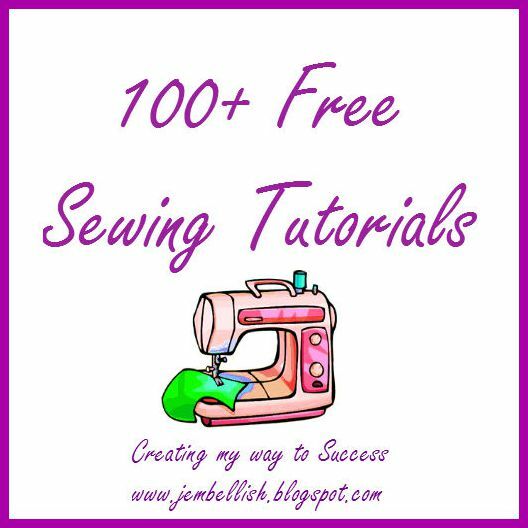 There are now over 100 Free Sewing Tutorials for all levels of sewing ability available on this blog. okay that is adorable! great tutorial!! thanks for following my blog, I'm now following yours too!! Your travel wallet looks so much better than the generic one you were given. Much more festive and exciting. Very detailed instructions, Jill. The document wallet is such a practical idea for keeping everything safe, yet at your fingertips. Love the material!!! I have some left over, so now know what to do with it. Love the fabric! It is so fun. The elastic closure was a great idea too! Great tutorial! Looks like you're really getting to grips with zips. They're not that hard are they!? This is so cute, I really want to make one! This is such a great idea. I will have to make one! I hope you will share this at my Delight Me party over at Doodles & Doilies. fabulous! i love the fabric...where was this vacation to?? I like the travel document wallet post because it contains such a fine information that is easy to understood for me. A new insulated and waterproof reef bag!